Walker County's growing reputation as an outdoor adventure destination just received a boost from regional travel industry professionals. Northwest Georgia's Historic High Country Travel Association (HHCTA) recognized Walker Rocks with the 2018 Award for Association Excellence for Best Marketing Campaign. campaign launched with the creation of videos highlighting local attractions, a start-up grant competition to encourage business growth in the tourism industry and the introduction of walkerrocks.com and several social media platforms, among other efforts. "It's thrilling to know that others in the region are taking note of what we have to offer here in Walker County," said Lacey Wilson, President of the Walker County Chamber of Commerce. "The Chamber is proud to be part of the collaborative team working to showcase and share the assets of this community with the rest of the world." Robert Wardlaw, Economic & Community Development Director for Walker County Government, said "This validates the valuable role tourism plays in our community. Six months in and we're already seeing an increase in sales tax revenue and a boost in occupancy at area accommodations." Wardlaw added, "Walker Rocks is fun, but Walker Rocks is also an economic initiative to help bring equity to our tax base, which in turn helps our citizens." The awards were presented at the Historic High Country Travel Association meeting in Cartersville Thursday, Dec. 6. HHCTA, which is comprised of travel industry professional from a 17-county area, also honored one of Walker County's cities for its tourism efforts. HHCTA named the City of LaFayette's Honeybee Festival as Best Event and LaFayette Mayor Andy Arnold as Tourism Advocate of the Year. The Friends of the LaFayette-Walker County Library recently donated a check for $8,000 to the library. The money was raised throughout the year during community fundraisers, business and individual donations, and memberships. "The money donated today will go to help fund projects and programs used throughout the year," Library Manager Tim York said. Friends President Rachel Oesch Willeford said the organization hosts several fundraisers to raise money for the library. "We have an adults-only evening event each year with a silent and live auction, we host a princess party and 'Cocoa with Santa' each year, and this year we added a fall wreath fundraiser. All of these events are run by community volunteers who donate their time, talents, and money to the library." For more information about the Friends of the LaFayette-Walker County Library, contact Rachel Oesch Willeford at 706-200-8099 or racheloeschwilleford@gmail.com. Mizpah Congregation came together, everyone bringing their own menorah, and lit the candles together at their celebration on December 7. The first week of December this year, people around the world are celebrating the eight-day festival known as Hanukkah, or the Festival of Lights. The name of the holiday comes from the Hebrew word (Chanukah), meaning "Dedication" or "Consecration." Although according to Jewish custom it is considered a minor holiday, Hanukkah has become, alongside Passover and Purim, one of the most beloved Jewish holidays. In the year 168 B. C. E, Syrian King Antiochus Epiphanes sent soldiers to Jerusalem, where the Syrians desecrated the temple – one of the holiest places for Jews at this time. The king also outlawed observance of the Shabbat, or Sabbath, festivals, and circumcision, instead setting up altars for the Greek gods. The Jews were given an ultimatum: convert or be put to death. On the 25th day of the Hebrew month of Kislev, the temple was renamed and dedicated to the Greek god, Zeus. The Jews led a resistance movement and although they were outnumbered, they won two major battles against the Syrians. This is why the festival is known as Chanukah, or dedication. It is named in commemoration of the rededication of the temple following the Greek occupation of said holy place. Today, it is celebrated as a reminder for modern Jews to rededicate themselves to keep the flame of Judaism alive and "live Jewish" for years and generations to come. Legend has it that when the Jews re-entered the temple to reclaim it, they immediately relit the ner tamid or "eternal light," which burned constantly in the temple and is still celebrated in synagogues today. There was only one bottle of oil left in the temple, however, which normally is only enough to light it for one day. They sent a messenger out to retrieve more oil, but it took him eight days to complete this task. To their surprise, the eternal light continued to burn for all eight days until the messenger returned. Today, Hanukkah is celebrated for eight days in remembrance of this. Jews around the world light the Menorah, a candelabra with eight candles. A candle is lit every night of the festival. Originally, gifts were not given, but in the early 1900s, Jews began to add gift-giving to Hanukkah celebrations. It is celebrated through traditional foods such as braised brisket and latkes (potato pancakes), games such as dreidel, and the exchanging of gifts. Here in the Chattanooga and North Georgia area, the Jewish community is quite close knit, being small in numbers. 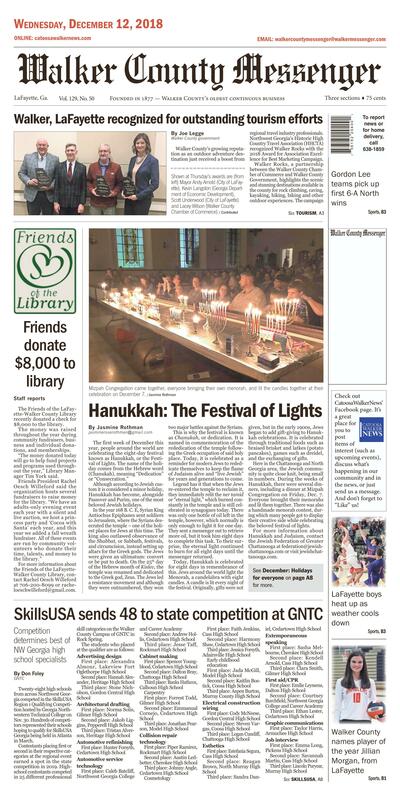 During the weeks of Hanukkah, there were several dinners, including a dinner at Mizpah Congregation on Friday, Dec. 7. Everyone brought their menorahs and lit them together. There was also a handmade menorah contest, during which many people got to display their creative side while celebrating the beloved festival of lights. For more information about Hanukkah and Judaism, contact the Jewish Federation of Greater Chattanooga at federation@jewishchattanooga.com or visit jewishchattanooga.com. Carpentry contestants compete in the high school SkillsUSA regional qualifier held at Georgia Northwestern Technical College's Walker County Campus on Nov. 30. Twenty-eight high schools from across Northwest Georgia competed in the SkillsUSA Region 1 Qualifying Competition hosted by Georgia Northwestern Technical College on Nov. 30. Hundreds of competitors represented their schools hoping to qualify for SkillsUSA Georgia being held in Atlanta in March. Contestants placing first or second in their respective categories at the regional event earned a spot in the state competition in 2019. High-school contestants competed in 25 different professional skill categories on the Walker County Campus of GNTC in Rock Spring. "The competitions went very well this year," said GNTC SkillsUSA Advisor Missy McClain. "The talent was exceptional this time around, and our high schools in Northwest Georgia will be well represented. 2019 should be a very good year for our area." GNTC is known for its prowess on the national stage of SkillsUSA at the collegiate level. This past summer, GNTC sent 17 national qualifiers to the 2018 SkillsUSA National Competition in Louisville, Kentucky in June. Seven of those finished in the top 10 in the nation. In 2017, GNTC's Ryan Fincher of Cedartown, Ga., won the national championship in the category.